While heading back to Brooklyn from Midtown last night, I entered the 6th Ave. IND at 42nd St. That entrance on the north side of 42nd St. — underneath the Grace Building one one side and the Bank of America building on the other — is a bit odd. It features a row of turnstiles and no station agent. 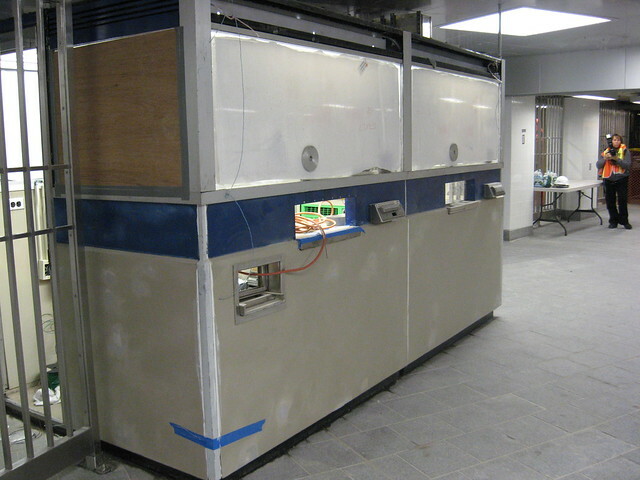 The booth too has long since been removed, a victim of the MTA’s aggressive cost- and personnel-cutting efforts. Usually, I see people enter the station without incident, but tonight, as four young kids dressed in the colors and jerseys of the Ireland soccer game went to take the B or D up to Yankee Stadium for the match, at least one of them jumped the turnstile. No one was around to stop them, and it’s possible that even a station agent ensconced in a booth wouldn’t have been much of a deterrent as the offender didn’t take stock of his surroundings. I just smiled to myself. The station agent debate has laid dormant for a few years. Citing security fears, union officials and transit rider advocates alike protested the MTA’s plans to cut station agents and dismantle token booths. It was a sign that this decision was a permanent one, unlikely to be reversed. Each station still had an agent on duty at all times, but that often meant an agent was located across four tracks or an avenue with no view down the platforms. While station agents are offer a passive presence, even the psychological element seemed to be removed. For its part, even as concerns over system safety in an age of terrorism remain, the MTA has long maintained that the system has never been safer. During my talk at the Transit Museum last week, Joseph Nugent, the Interagency Liaison between the NYPD and NYCT, claimed that station entrances without agents are generally safer. Nugent said that customer diligence and heightened awareness has led to this result, but it’s possible that, without station agents around, fewer subway riders are reporting potential crimes. Jammed Metrocard readers and turnstile jumpers remain a low-level concern, but NYPD enforcement has stemmed that tide. Now though as the TWU languishes without a contract, the debate is back. With an assist from Council Member Jimmy Van Bramer, the TWU is again demanding more station agents. “Machines can’t do the job that we do. 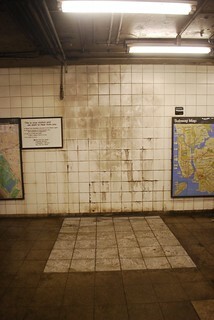 They’re constantly out of service,” TWU Local 100 Member Derick Echevarria said to a New York 1 reporter last week. Of course, what job the station agents do varies drastically from person to person with some apathetic and some very helpful. As part of the protest, the TWU has presented a petition to the MTA, but the agency says it has no plans to restore any agents or booths. In the indeterminate future, MTA customers will be able to use Help Point intercoms for immediate access to a centralized information or emergency alert system, and underground cell service will assuage some safety concerns as well. I’ve tended to err on the side of fewer station agents as I’ve often found those in the booths less than friendly and not particularly helpful, but I understand why people may want more of them around. What’s really going on here seems to involve the TWU’s agitating for attention. The union’s contract situation remains unresolved, and until Tom Prendergast is confirmed as the MTA’s CEO and Chairman, nothing will happen. It’s been 17 months since the last contract expired, and the union is looking for any sort of political support or traction. The station agents won’t come back, and the TWU knows it. But it’s an easy way to get some press coverage amidst slow negotiations.